Fantastic – sounds brilliant for creative teams. Acknowledgement can empower already present gifts, or reveal unknown ones. Love it. I’ve heard a similar technique work brilliantly in community workshops where kids from broken neighbourhoods were given a card each and asked to list both their faults and their plus points. The usual trend was for loads of negatives, hardly any positives. Then the card went round the circle and kids asked to list negative and positives of another’s card. It turned out that when handed round the circle the card would come back to each individual with only positives added, in rare cases a negative. It was such a transformation of each child’s self-image that they could feel appreciated and KNOWN in their home communities. This diversity of application suggests a strong core principle. Creatives and teenagers need recognition alike. your comment sparked a memory of this personal development course i did several years ago, where we did 2 different exercises. one was a “what i see in you that i see in me……..” that we had to do with each person in the course (less than 15 people total. intimate.) it was both strengths and vulnerabilities that we identified in each other, and was very powerful in realizing we are not alone in our emotions. both were just really great ways to feel empowered by those common threads and themes that are woven through all of us. That is a great approach. As you mention, sometimes others see in us qualities that we ourselves don’t see it or see it but don’t give enough credit for. To me the other beauty of this approach is that in time we have a ‘model database’ of personalities & qualities – people who excel at certain attributes. This can be a powerful source for your own personal growth as you can draw insights from these folks on how they approach certain situations, events, or context. And of course, understanding the strengths or what someone is strong at is as you mention a key in understanding the tribe dynamics and also in understanding why some of the things did not work as well. Would definitely favor adopting this practice in our own community to get to know each other better and deliver better value to the world outside. Sounds great. You might also want to take a look at Vicky Grey’s work. Her twitter handle is @AdaptiveCoach and has a very neat book called Making Time. She has a long practice training high performance teams in the IT space. You might also be interested in a pretty neat visualization tool at http://ilnk.me/d624 It seems to work very well in a nemetics framework . 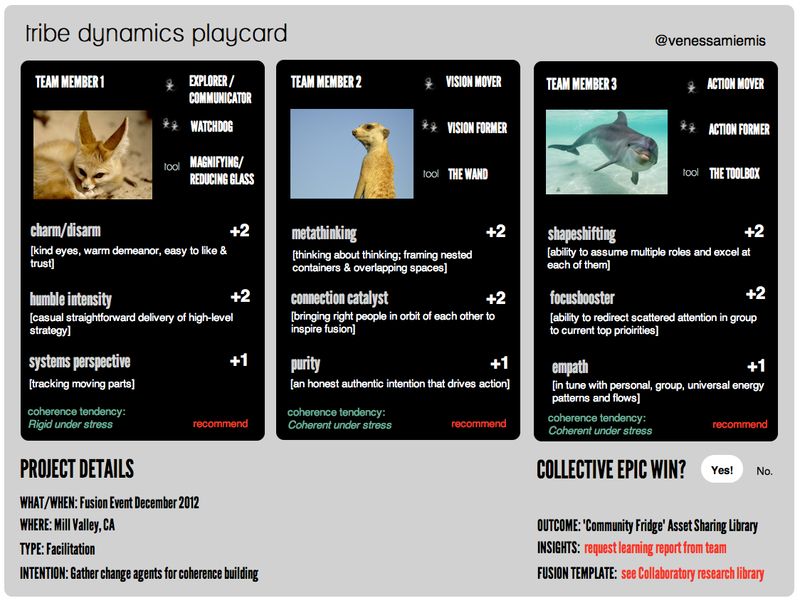 We’ve been using it for a day or so to play with 7 dimensions to see how complex adaptive systems can evolve over time. hey, i checked out the visualization tool. i don’t get it. how are you applying it? I think the easiest way to check out is to select “Oscillate” at the bottom. This will start the waves. Then you can play around with the variables – amplitude, frequency, damping, tension etc. to see how things change. Michael – correct me if I am interpreting this wrong. That’s about right. You can view in oscillate or pulse. Both are pretty interesting and analogous to the paradox of “light is a wave v light is particular.” Setting it on Pulse allows one to see how the math governing string vibration generate a district point at which a pulse is generated and propagated. the more interesting to me is the Wave Oscillation. The interface you gives 7 parameters to control . Amplitude and Frequency can have 100 different values.. Damping has 100 values. Tension has 11 values. Endpoint has 3 options. Fixed. Loose. None. Nemetics uses a fractal naming convention. Neme, nemistring, nemitangled nStrings and nemisphere all point to precisely the same phenom. The different words are used to highlight different properties depending on the angle and scale of the view. So, the entire wave form can be seen as a neme, a nemiString, nemitangled NemiStrings or nemispheres. “Learning” is said to be optimized when the wave form has a regular smooth and stable shape. Amplitude maps2 reach of communication event. Frequency is frequency of communication event. Damping maps2 to Friction or Resistance. Endpoint maps2 to boundary condition of the nemiSphere. After playing with it a couple of days, some folks are seeing patterns that seem isomorphic to real world phenomenon. One of my proximate interests is managing my IRA so I tend to play with to emulate patterns in global capital markets. Seems pretty good so far. On twitter some convos today with @CounterPane and @rpickett77 about using nemetics and the visualization tool in the service of Action Research. As of tonight it seems they feel it helps.